Are your windows looking a bit dusty and dingy this summer? Cleaning them up will make your whole home seem brighter and more brilliant. Window cleaning does not have to be a demanding chore, either. 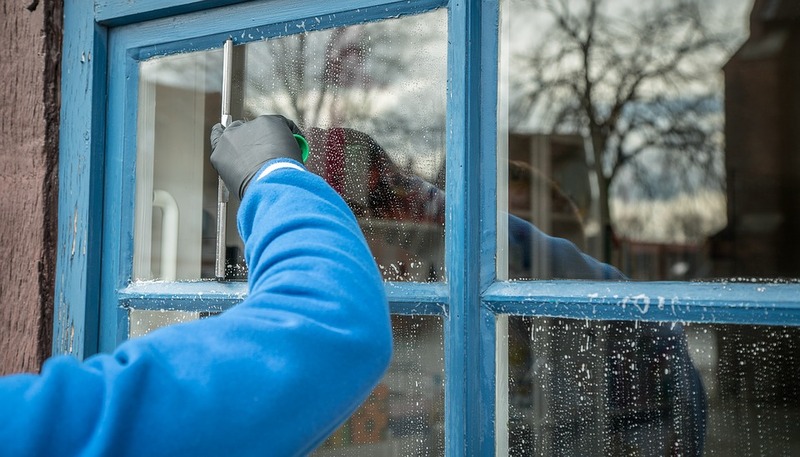 Follow these six simple tips to make window cleaning a breeze! 1. Clean on a cloudy day. If you clean your windows when it’s too warm and sunny out, the cleaning solution will dry on their surface, leading to smudges and smears. So, pay attention to the weather forecast, and pick a cloudy day to clean your windows. 2. Use soapy water, not window cleaner. Using a bottle of spray-on window cleaner and paper towels is a common approach, but its not the best one. Especially for the exterior of your windows, you’re better off using a bucket of sudsy water. Your results will be less streaky, and you’ll actually remove bugs and grime rather than just smearing them around. Just fill a bucket with warm water, add a generous squeeze of dish detergent, and lather it up to create suds. You’ll also need a window mop, also known as a washer wand, to apply the soapy solution. 3. Scrub gently with your wash wand. To clean your windows, dip your wash wand in the soapy water, and then apply the soapy water to the window. Rub it in every direction to make sure you loosen all of the grime. 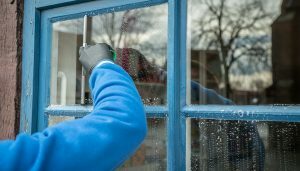 If your windows have more than one pane, scrub one pane at a time so the solution does not dry before you get the chance to remove it. 4. Perfect your squeegee technique. Once the entire window is soapy, it’s time to reach for your squeegee. Start in the top, left hand corner, and pull the squeegee straight across the window until it reaches the right-hand side. Then, return the squeegee to the left-hand side of the window, and pull it across again — in a line just beneath the first line you created. Repeat until the window is free of suds. 5. Attack details with a cotton swab. Let your windows air dry, and then inspect them carefully to see if there are any remnants of dust in the corners or along the edges. If you do spot dirt, you can dip a cotton swab in your soap solution and then use it to rub away the grime. 6. Have a helper on hand if you must climb a ladder for window cleaning. Most double-hung windows fold in so that you can clean the outside of the windows from inside your home. However, if you have older windows, you may have to climb up on a ladder to reach those on the second story. Never do this alone; always have a friend present to hold the ladder and hand you equipment. If you’re not confident climbing on a ladder or if window cleaning has you feeling overwhelmed, contact Hassle Free Home Services and let us tackle the task for you.